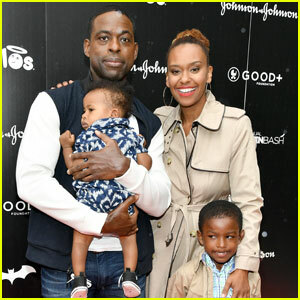 Sterling K. Brown poses with wife Ryan Michelle Bathe and their children while attending the First-Ever GOOD+ Foundation Halloween Bash hosted Jessica Seinfeld at Sunset Gower Studios on Sunday (October 30) in Hollywood. The This Is Us star and his cute family were joined at the event by Gwyneth Paltrow, Sarah Michelle Gellar, James Van Der Beek, David Walton and Majandra Delfino, Tiffani Thiessen, and Gabe Saporta and Erin Fetherston. Also in attendance were Black-ish stars Miles Brown, Marcus Scribner, and Marsai Martin. FYI: Sterling is wearing Kenneth Cole. Cobra Starship Teams Up with Icona Pop on 'Never Been In Love' - Watch the Lyric Video Now! Check out your first listen of Cobra Starship‘s brand new song “Never Been In Love” featuring Icona Pop! The track serves as the band’s lead single taken from their upcoming fifth studio album, which is scheduled to be released later this year. Be sure to pick up the song on iTunes if you like what you hear! Jamie Chung and Dylan McDermott pose for photographs while attending the 2013 Victoria’s Secret Fashion Show After Party held at TAO Downtown on Wednesday (November 13) in New York City. The 52-year-old actor and Jamie, 30, were joined on the pink carpet by Ciara, Stephen Dorff, Katrina Bowden, Bryan Greenberg, Fall Out Boy, Gabe Saporta and Alex Suarez of Cobra Starship, and director Michael Bay. FYI: Ciara is wearing a Prabal Gurung dress paired with Guiseppe shoes. Jamie is wearing a Parker dress. Rosario Dawson has a rockin’ time while hosting the Yellow Fever presentation held at The Penthouse at the Rivington Hotel on Wednesday (August 7) in New York City. The 34-year-old actress was in attendance to help support her designer pal Jamison Ernest launch his new collection. Newlyweds Gabe Saporta and Erin Fetherston, as well as model Linda Vojtova, were spotted attending the event, where Peroni beer and special Belvedere cocktails were served.